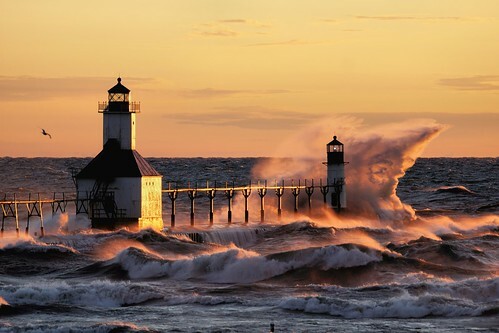 This gorgeous shot of the St. Joseph Pier Lighthouses demonstrates the incredible power of Great Lakes waves. I live in Traverse City, and this summer it feels like Lake Michigan has claimed the lives of more people than normal. Whether or not that’s true (it’s not), I thought this photo offered the perfect opportunity to share some tips and tools for staying safe on Lake Michigan, Lake Huron, Lake Superior and Lake Erie! Thinking of any of the Great Lakes as anything like any lake you’re familiar with is a mistake. They are freshwater seas that can pack incredible power. They are stronger than you and can end your life in an instant if you don’t respect them. Life jackets can save your life. U.S. Coast Guard statistics show that 90% of the people who drown in a boating or water accidents would survive with a life jacket. Cold kills! Hypothermia is a danger all year round on the Great Lakes. Click that link for tips on how to stay alive if you do end up in the water. Rip Currents (sometimes called “undertow” or “rip tide”) are a big danger on Michigan beaches accounting for the majority of drownings. Michigan is 4th in rip current related fatalities behind Florida, California, and North Carolina – we have “ocean force” rip currents. Learn how to beat them in this video. The National Oceanic and Atmospheric Administration (NOAA) offers comprehensive Great Lakes marine forecasts. The MyBeachCast smarthphone app can predict waves and warn you of hazardous conditions. Do you have more tips? Share them in the comments! Check it out bigger and see more in Scott’s Lighthouses slideshow and also check out a winter view of the pier that Scott shot. Catch a Michigan wave on Michigan in Pictures! Incredible what wind, water and way too cold can do! 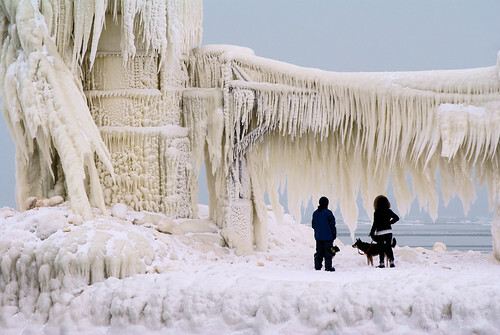 More about the St. Joseph lighthouse on Michigan in Pictures. Check this out on black and see more icy goodness in Scott’s lighthouse slideshow. 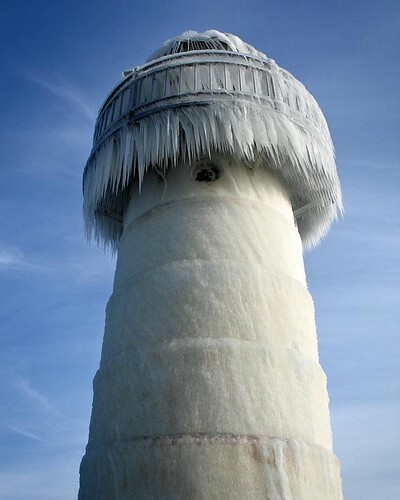 Wind, waves and winter work create some amazing ice formations on Michigan lighthouses. To see some of them. click over to the Lighthouse Ice show from the Absolute Michigan pool! 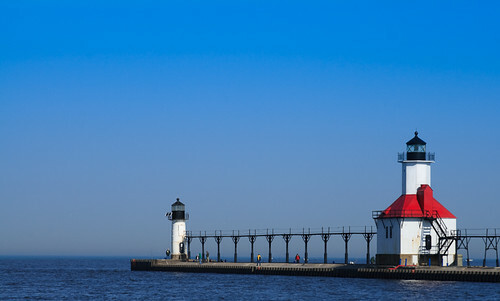 See this photo of the St. Joseph light bigger or in Brian’s Lighthouse set (slideshow). We’re headed into the season where trees explode with color in Michigan. 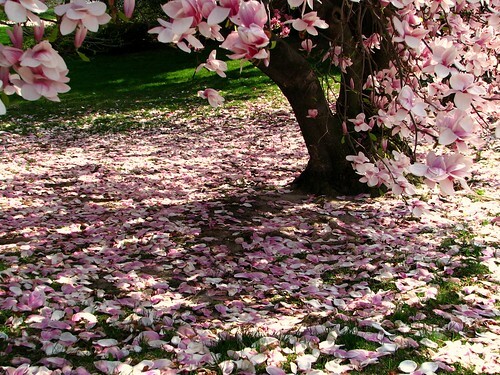 It’s celebrated in events like next weekend’s Blossomtime Festival. It happens the first Saturday in May every year in Benton Harbor and St. Joseph and is Michigan’s oldest multi-community festival. You can view this photo larger (and more blossoms) in Christina’s Natural set and also in her slideshow. For even more blossoms, check out the blossom slideshow from the Absolute Michigan pool! The Higgins boats discharge their cargo. (IMG_1314), photo by bill.d. 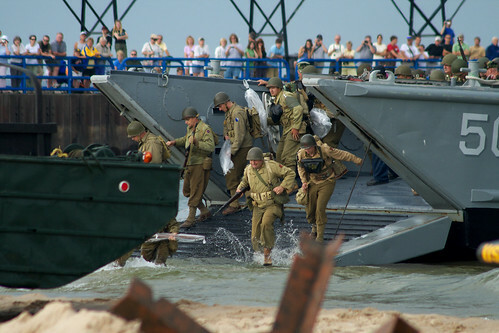 From the Things I Wish I Had Known About in Advance files comes this fantastic set of photos of last weekend’s D-Day re-enactment in Benton Harbor and St. Joseph (slideshow). Bill uploaded them all nice and big so be sure to cruise through that slideshow link. Or even better, download PicLens, click the set link and enjoy. (trust me on the PicLens thing – coolest web software I’ve seen in quite some time). The 2008 Saint Joseph and Benton Harbor WWII Reenactment Weekend took place last weekend and was sponsored by the veterans’ organization Lest We Forget of SW Michigan. It was designed to teach folks about WWII history, veterans, and the equipment utilized and featured reenactments of the battles at Normandy (D-Day) and Peleliu (Palaus archipelago in the Phillipines). Because I can, here’s a link to an amazing reenactment of the landing at Omaha Beach. St. Joseph River Valley, photo by mojophiltre. 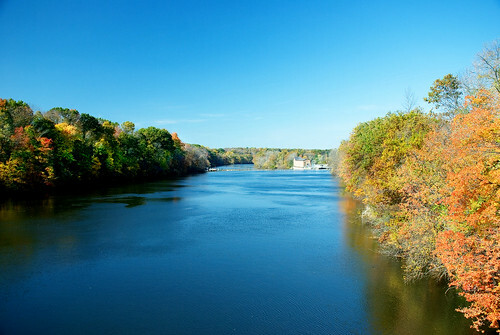 Mojophiltre took this photo of the St. Joseph River, just above the Buchanan Hydro-Electric Dam. He has a view of the water going over the Buchanan Dam that you’ll want to check out too. The Miami called it Sauk-Wauk-Sil-Buck (which The Google thinks means “River of Mystery”). The Iroquois, who apparently conducted a nasty genocidal campaign on the Algonquian in the region, called the river The Illinois – maybe because the first Algonquian tribe they met were the Illinois. In spring of 1672, Explorer Rene-Robert Cavalier De La Salle (searching for the best route between Quebec and the mouth of the Mississippi) ran into the Miami (who by this time were in the pay of the Iroquois against their Algonquin brethren), so naturally he christened it The River of the Miamis. Jesuit Missionary Claude Allouez (who earlier had named Lake Michigan “Lake Saint Joseph” after first sighting it on Catholic Feast Day of Saint Joseph) founded a mission at the rail junction at Bertrand. It’s noteworthy that when LaSalle returned later, he still called it the River of the Miami. North and east, the French built Fort St. Joseph near Niles in 1691. At that time the Potowatomi (who called the river Sohg-Wah-Se-Pe – also Mystery River) were friendly with the French. Around 1700, the Fox & Sauk tribes, who were allied with the English and named the river O-Sang-E-Wong-Se-Pe (Mystery River again), began to tangle with the Potowatomi and French. The authors advocate for naming the river the Sagwa. I don’t know about that, but I do know that time seems to mysteriously disappear when I run into cool Michigan history like this!